Benoît and the Mandelbrots see the laptop as their main instrument; they are mainly dedicated to live coding: the process of writing software in real-time. They use the programming language itself as an at first sight non-intuitive, but simultaneously expressive interface between man and machine in order to improvise sound and music. Sonic conceptions and structures are expressed live as source code, and interpreted by the computer. 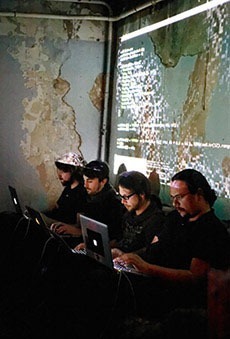 The laptop musicians are connected over a network, enabling them to communicate, synchronize and share data. With the flexibility of live coding the sounds are generated specifically to fit the room characteristics and the audience of the performance. As every performance setting is unique and improvisation is the main paradigm of the group they don’t perform ‘works’ in a classic sense, but consider their whole oeuvre and underlying concept as their work, which expands with every performance. The musical results vary from electronica and ambient to experimental, noise, drones and avant-garde depending on the event, audience, venue and course of the collective improvisation. The ensemble was formed in winter 2009 by students of the IMWI (Institute for Musicology and Music Informatics) at the Karlsruhe University of Music. Since then they have played over 60 concerts in different locations and events, notably at BEAM Festival 2012 in Uxbridge, SuperCollider Symposium 2012 in London, Network Music Festival 2012 in Birmingham, Laptops Meet Musicians Festival 2011 in Venice, next_generation 4.0 at ZKM Karlsruhe and LINKS Biennale für Neue Musik 2010 in Heidelberg. They received an Honorary Mention at Prix Ars Electronica 2012 in the category Digital Musics & Sound Art.